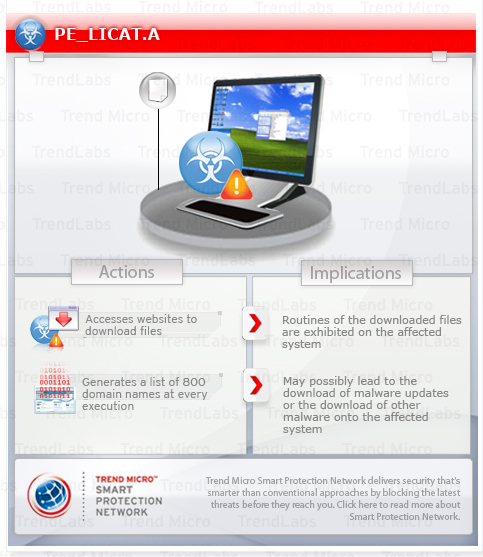 Trend Micro has received multiple samples of this malware from multiple, independent sources, including customer reports and internal sources. These indicate that this file infector poses a high risk to users due to the increased possibility of infection. To get a one-glance comprehensive view of the behavior of this File infector, refer to the Threat Diagram shown below. This file infector executes the downloaded files. As a result, malicious routines of the downloaded files are exhibited on the affected system. Scan your computer with your Trend Micro product to clean files detected as PE_LICAT.A. If the detected files have already been cleaned, deleted, or quarantined by your Trend Micro product, no further step is required. You may opt to simply delete the quarantined files. Please check this Knowledge Base page for more information. Scan your computer with your Trend Micro product to delete files detected as PE_LICAT.A. If the detected files have already been cleaned, deleted, or quarantined by your Trend Micro product, no further step is required. You may opt to simply delete the quarantined files. Please check this Knowledge Base page for more information.